Looking for something slightly more challenging? Why not try my Sampler Blanket Pattern? If you are going to become a knitter a part of that process is experimenting with the different knitting techniques as you gain experience. As a beginner, each time you begin a new pattern it is a good idea to make a tension square to check your tension before you start knitting your garment. So what do you do with all those tension squares when you have finished with them? You have a couple of choices. 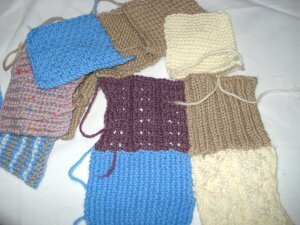 You can unpick each of the squares and re-use the wool for your garment or you can collect the squares and make a blanket with them. If you are going to unpick your squares, I suggest you do it as soon as possible as the yarn retains the memory of the knitted shape and when you reuse it you knitting will be a bit 'bumpy'. The Sampler Blanket can be as large or as small as you desire. 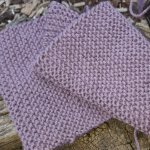 Each square is approximately 15 cm square so your width and length will be a multiple of 15. To make a sampler blanket you will need small quantities of a variety of 8 ply yarns. 1 pair each 4.00mm (UK 8, US 6) or size needed to give correct tension. Using 4.00mm Needles, cast on 34 sts. 1st row - Knit all stitches to end. 2nd row - Purl all stitches to end. Rep 1st and 2nd rows until work measures 15cm ending with a purl row. Rep 1st row until work measures 15cm ending with a wrongside row. 1st row - K1, *P1, K1, rep from * to last st, P1. 2nd row - P1, *K1, P1, rep from * to last st, K1. Rep 1st and 2nd rows until work measures 15cm ending with a wrongside row. With a slightly damp cloth and warm iron, press lightly. Using back-stitch, join blocks into rows. Then using back-stitch, join rows to form the blanket.